Our most popular course. 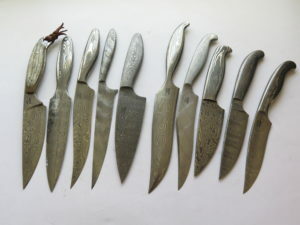 For those wanting to cover the most comprehensive course in forging knives and damascus in the shortest space of time. 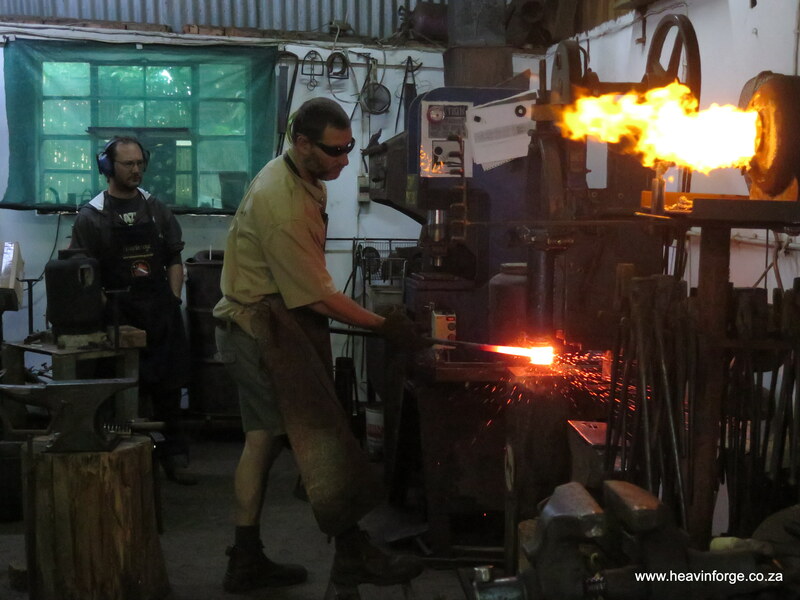 This course covers all that you would learn on the Basic Bladesmithing course as well as the Introduction to Damascus course at a much-reduced price: you save R1 750 per person by doing the Full House 5-day course as opposed to doing two courses separately. You will make a carbon steel knife and sheath worth over R2 000 and a damascus steel blade worth over R2 900. Not suitable for people who are allergic to nickel. Bladesmithing is the historical and traditional way of knifemaking by bladesmiths using high carbon steels. 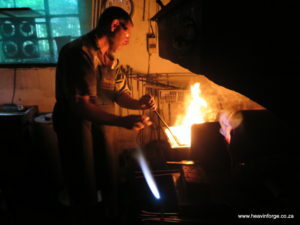 Utilizing hammer, fire and anvil a knife will be made proceeding from design, forging, heat-treatment, grinding, polishing, handle, leather sheath making and sharpening. 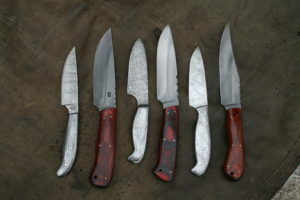 You will come away with your own hand-forged knife and sheath as well as the knowledge to make more. (The bug will have bitten!). You do not have to be big and brawny to do this course! You will make a knife that is worth more than R2 000 on this course. Students knives from the "Full House" course. For anyone, beginner or advanced, who is serious about their Bladesmithing. Particularly important for ABS Apprentice Smiths wishing to submit their knives for ABS Journeyman Smith evaluation, as attending the course, cuts one year off their three-year apprenticeship. Great course for stock removers who want to branch out into forging knives. Recognised by the American Bladesmith Society, this course is presented by the only two ABS Master Bladesmiths on the African continent, husband and wife team, Kevin and Heather Harvey. There are 7 ABS recognised schools in the world. Five ABS schools are in the U.S.A, one in Belgium and Heavin Forge in South Africa. This is an intensive two week, eighty hour, hands-on course which covers all aspects of forging, grinding, heat treating and sharpening blades. 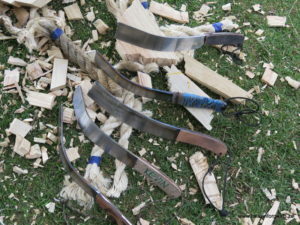 One blade will be used to do the (unofficial) ABS Journeyman performance (cut and bend) test at the end of the course. This test is also required if submitting forged blades for evaluation to gain entry into the Knifemakers' Guild of Southern Africa. 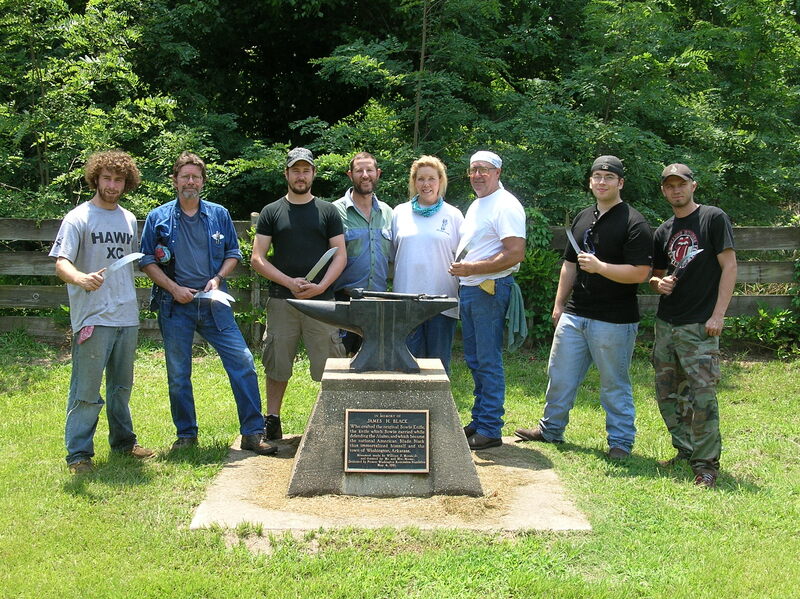 Kevin and Heather have taught this Introduction to Bladesmithing course a number of times at the Bill Moran School of Bladesmithing in Old Washington, Arkansas, U.S.A. They endeavour to impart their knowledge and love of the forged blade to their students. Numerous different forged blade shapes are taught to educate the students as to the many varied ways of forging, heat treating and grinding. We try to finish 3 to 5 blades to a point where they can easily be finished at home after the course and sold. The sale of these knives should easily cover your course fee. Lectures are given each day on subjects covering how to select your steel, designing knives, safety in the workshop, the safe use of gas forges, blade geometry, heat treatment, grinding, hand finishing, filing, forging unusual shaped knives/weapons, forging other metals, the business side of knifemaking, the ABS and KGSA testing and much more. Evenings will be spent watching ABS forging DVD's. Each student is entitled to take home his finished blades to complete at home. This course does not cover handles, guards and sheaths, for this reason, we suggest students stay on for the 5-day Handles, Fittings and Sheaths course often held the week after the ABS course. A certificate will be issued at the end of the course. Kevin and Heather have a vast library of knifemaking/Bladesmithing/blacksmithing books and videos which can be read/viewed while on course. Comprehensive notes are provided as well as a denim apron, safety glasses, leather gloves, a simple face mask, tin of Harveys Conservation Wax and all consumables. Tea, coffee, cool drinks and biscuits/rusks are provided. 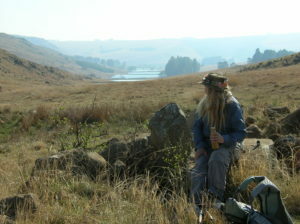 If you are here by car and stay the weekend, we can help organise a few fun activities in the region in the area such as whisky tasting, a visit to our micro-brewery in Dullstroom - Anvil Ale, fly-fishing, horse riding, clay-pigeon shooting, archery, hiking or game viewing. If you are coming from overseas, we strongly suggest that you include a holiday to the Kruger National Park, just three hours away from us as well as sightseeing in the area or a visit to the Kingdom of eSwatini, just two hours away from us. If you wish to plan a safari please contact us and we can put you in contact with the right people. 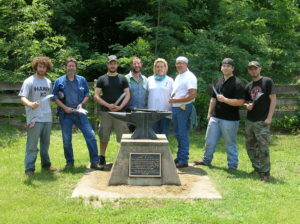 Heavin teaching at Bill Moran School of Bladesmithing, Old Washington, Arkansas, U.S.A. Performance test knives after surviving various cutting tests and the 90 degree bend. If you wish to do this course, please contact us, as it is not a scheduled course and can be done on almost any day that suits everyone. You have to have completed one of our other courses first. This course offers you the chance to learn how to fit handles, guards and bolsters to your blades as well as how to make a sheath. 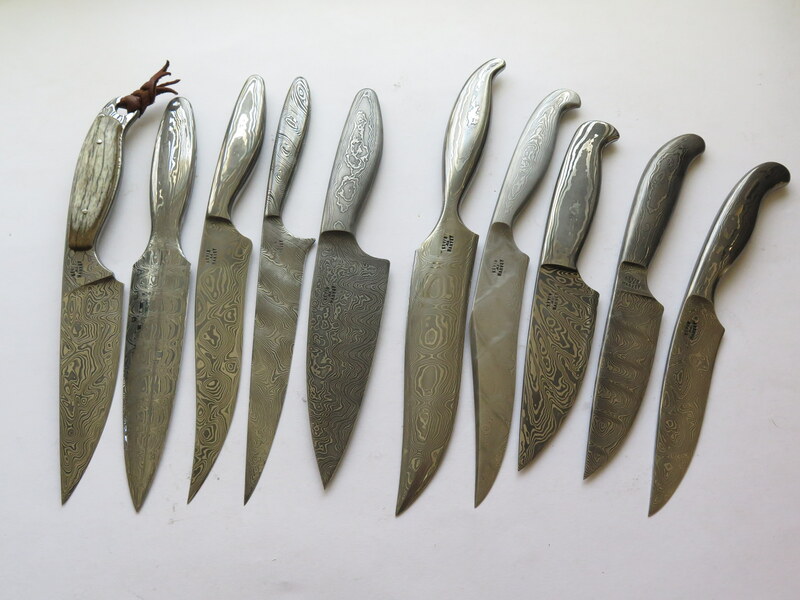 We find that a lot of our students either don't have the facilities or know how to complete their knives once home, especially the students from our 2-week ABS course who have only made blades, no handles and sheaths, as done on our other courses. Lectures will include handle construction and design, stabilizing bone and wood, finishing handles with gunstock oils etc. You are required to bring one or two finished blades with you, either made at home or on a previous course with us as well as your handle, guard/bolster and pinning materials if using anything other than standard wood, brass and nickel silver, which will be provided. Some limited fancier materials will be available here to purchase. 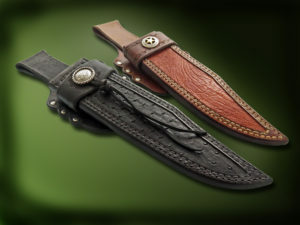 We will supply basic sheath leather but any exotic leathers must be brought with you. The projects tackled by each participant might be different and we feel those attending will learn from each other too. Two Bowie sheaths - Kevin Harvey. You need to have completed any of our other courses to qualify for this course. It will be assumed that you have basic bladesmithing skills such as forging, grinding, handle fitting and heat treatment concepts and have done some bladesmithing work of your own at home. 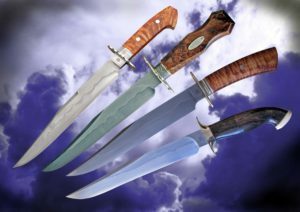 Forge a classic Bowie knife under the expert guidance of Mastersmith, Kevin Harvey, who specializes in and loves this style of knife. On this course, you will make a Bowie with a blade length of at least 10" (250mm). We will include differential heat treatment of the large blade of 1070 carbon steel. This steel responds well to an edge quench or Japanese style clay hardening. The handle construction will be built on a narrow tang and you will be allowed to use multiple segments for the guard and ferrule assembly, located together with dowel pins. The handle material will be provided and will be a special block of attractive wood. You are welcome to bring your own special piece of wood if you prefer. 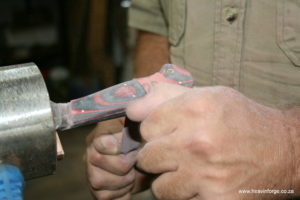 Advanced techniques such as sculpted guards and frame tang construction may be used, if your knifemaking is at a stage to push your comfort zone. The history of the man, Jim Bowie and his famous knife will be discussed. The theory and Kevin's design consideration will be shared, to ensure a strong, functional knife with superior balance and aesthetics. We will not have time to cover any leather work. If you would like to learn sheath making, consider doing the "Handles, Fittings and Sheaths" course. 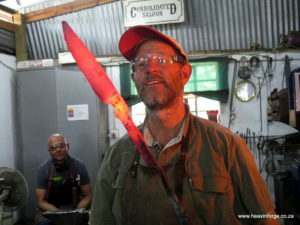 Kevin Harvey forging a Bowie knife. Bowie Knives by Kevin Harvey. Kevin shaving with one of his Bowie knives. You have to have completed the Basic Bladesmithing or ABS Intro to Bladesmithing course with us as the fundamentals of forging and heat -treating high carbon steels are covered in it, and this experience is required for making a damascus knife. Alternatively, you can join the 5 Day Full House Bladesmithing Course, which combines the Basic Bladesmithing with the Introduction to Damascus Course at a reduced course fee. This course includes material selection, preparation, lamination (forge-welding), patterning, forging to knife shape, grinding, heat-treatment, polishing and etching. The knife is completed to a stage where the maker can fit a handle at a later stage or an integral knife is made. Handle and sheath making was covered in the previous Intro to Bladesmithing course. Work is done using a high-temperature gas forge and the "Iron Maiden" power hammer. You come away from this course (hot and sweaty!) with the knowledge of making basic traditional folded damascus steel and how to turn it into a stunning blade. 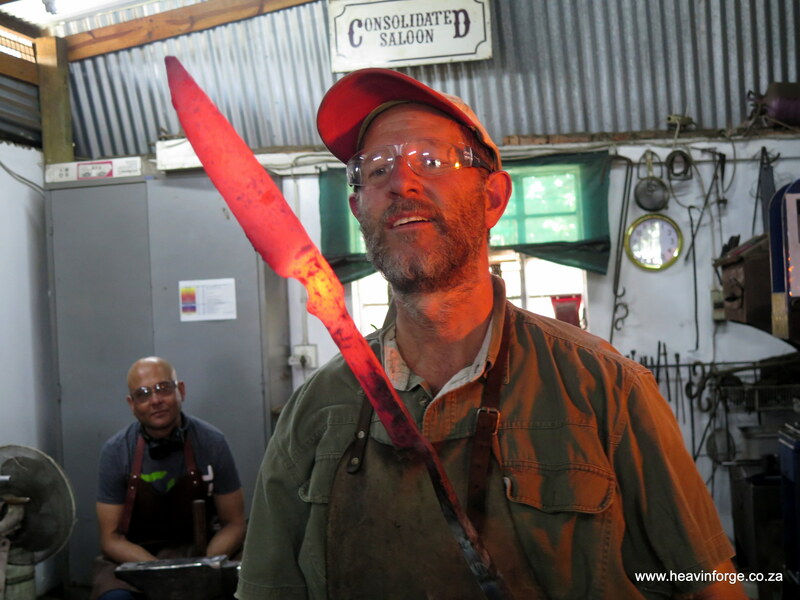 You will make a damascus steel blade on this course that is worth more than R2 900. Not suitable for people who are allergic to nickel. If you would like to do this course, please contact us, as it is not a scheduled course and can be organized on dates to suit people who have completed the Basic Bladesmithing or ABS Introduction to Bladesmithing course. What is Damascus steel ? - Over 2000 years ago man needed to create a strong steel. This he did by forge-welding and folding high and low carbon steels at high temperatures to create a steel that was flexible but hard enough to hold an edge. The pattern in the steel can be manipulated and is brought out by etching the steel in acid. Damascus steel was perfected by the Japanese and Vikings and it was believed to have magical properties. There are very few bladesmiths who make their own damascus steel these days and it is a rare and collectable material usually used for knife blades. 30 kg power hammer, Iron Maiden" made by Tom Nelson and Bertie Rietveld. 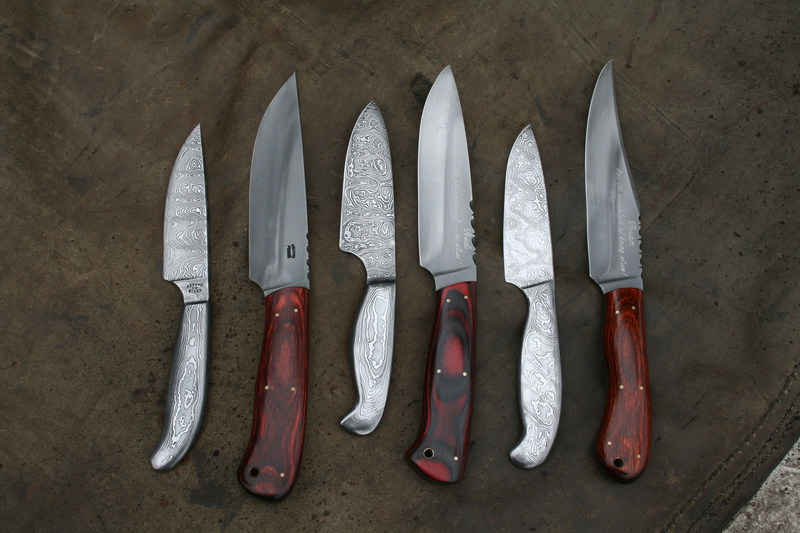 Integral damascus knives by Kevin Harvey.